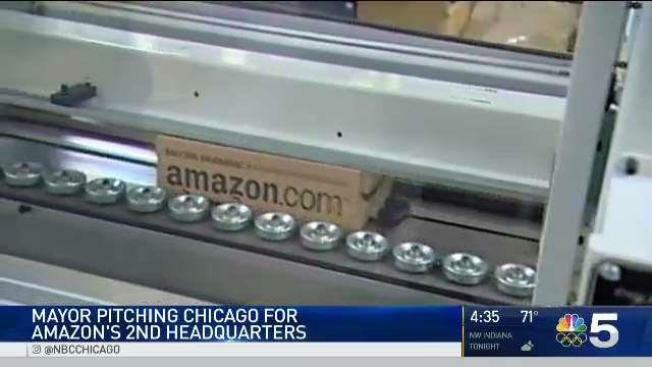 Chicago is hoping to win over Amazon as the company begins its search for a second headquarters. "Chicago's unmatched workforce, world-class universities and unparalleled access to destinations throughout the world make it the perfect headquarters location for companies large and small," Grant Klinzman, who works on the city's business development, said in a statement. "That's also why Chicago has led the nation in corporate relocations for the last four years." Amazon has promised to spend more than $5 billion on whatever site it chooses in North America. Founder and CEO Jeff Bezos said Thursday that the new headquarters will be "a full equal" to its Seattle counterpart with as many as 50,000 jobs. The announcement is certain to create a scramble among cities and states vying to make the short list. The company estimates that investments in Seattle between 2010 and 2016 added $38 billion to the city's economy. There are 24 restaurants and cafes within Amazon's Seattle campus alone, where more than 20,000 people are employed. The increase in personal income around the Seattle headquarters for people not employed by Amazon increased by about $17 billion due to direct investments, according to the company. Amazon will hire thousands of new workers, but also said that people working at its Seattle headquarters will have the option of seeking a spot at the new site. Cities and states are being advised by Amazon.com Inc. to visit www.amazon.com/amazonHQ2 for more information.